In the process of relocating towns, a man Driver and his girlfriend Betty stop at a roadside diner. There they are menaced by Flynn, a member of a gang that is responsible for a series of armed robberies and murders. Flynn is dragged away by the group’s leader Hoag. Back on the road, Flynn abruptly attacks the couple and drags them back to the gang’s cabin as prisoners. The gang are startled to find that Driver is holding a girl captive in a hidden compartment in the car – and that she is missing heiress Emma Ward for whom there is a two million dollar reward. While being held by the gang, Betty chooses to end her life by impaling her throat on a blade. Driver then breaks free and comes after the gang, eliminating his way through their numbers with his incredible skill as a hunter. As Emma explains to the others, he is a serial killer of genius level ability and near-superhuman hunting skill and is now coming to get her back and kill all of them. Japanese director Ryuhei Kitamura first appeared with the gore-drenched Yakuza zombie film Versus (2000). He subsequently went onto a number of other genre works such as the horror film Alive (2002), Aragami (2003) about an immortal samurai, the horror film Sky High (2003), Godzilla: Final Wars (2004), the animated science-fiction film Baton (2009), a live-action adaptation of the manga Lupin III (2014), the English-language horror Downrange (2017) and an episode of Nightmare Cinema (2018), as well as produced Battlefield Baseball (2003) and Hellgate (2011). Kitamura first ventured into English-language genre cinema with the impressive adaptation of Clive Barker’s The Midnight Meat Train (2008) and No One Lives was his second English-language film. I was greatly anticipating No One Lives because of Ruhei Kitamura’s work, especially on The Midnight Meat Train. No One Lives garnered a good deal of buzz and word of mouth before it arrived, premiering at the Toronto International Film Festival and doing the rounds of various fantastic festivals. This led one to expect that it would be an edgy film that pushed its audience in some amazing ways, trod across taboo lines or a host of such things. All that one can say is that they were disappointed. Seen, No One Lives boils down to being a fairly ordinary psycho film. There is nothing – no spin, no amazing twists, no unique reinterpretation – that makes the film anything more than that. The one novelty is the initial set-up where we get a gang of hoodlums/bikers – the sort that could easily have stepped out of The Last House on the Left (1972) – and what we think is a nice guy hero (Luke Evans) who is abducted and about to be tortured, only for this to abruptly be turned on its head to reveal that he is a calculating killer of genius potential. At this point, what we believed to be the gang of thugs is now thrown into the position of being the heroes of the show (of sorts). Ryuhei Kitamura produces the odd surprise – the unearthly moment that the dead body of one of the dead gang members sits up and Luke Evans emerges from inside; the discovery of Adelaide Clemens a prisoner hidden inside Evans’ vehicle; and of course the abrupt change of sympathies that comes around that point. 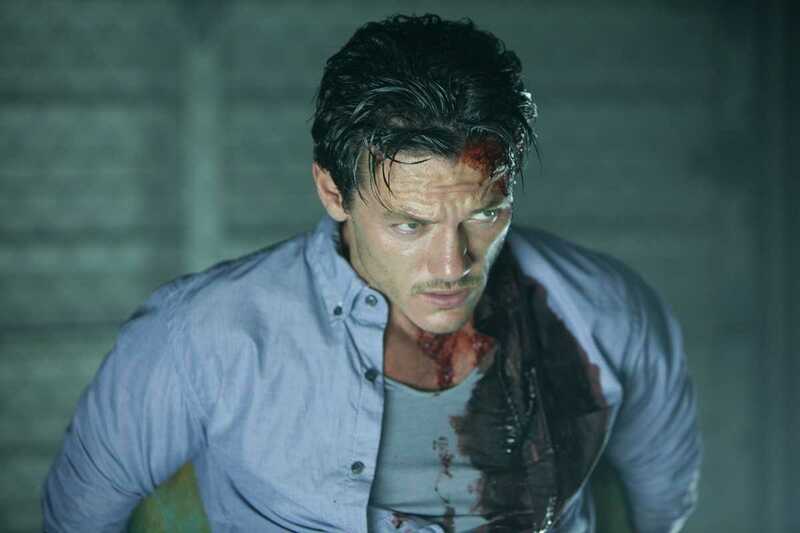 As the almost superhuman killer, Luke Evans has an intellectual coldness that proves rather fascinating. I kind of liked the way the gang kept panicking at everything he does, while Adelaide Clemens sits on the sideline calmly warning that what they are trying to do is useless and is ignored only to be proved right every time. No One Lives starts in with okay promise. However, it never seems to go very far from there. Ryuhei Kitamura produces a moderate level of gore – seeing Lee Teregesen fed into a meat grinder, a bag of entrails left at the door – but nothing that substantially pushes the envelope. Kitamura’s direction is reasonable but never gruellingly intensive; the script is serviceable but lacks any major twists. It is a passable entry but one was constantly expecting the film to be so much more. The surprise is how much the film seems to be paying homage to The Hitcher (1986) – where The Hitcher had a fiendish killer named John Ryder who outsmarts everyone he pursues at every opportunity, this seems to be conducting a tribute in having a fiendish killer known only as Driver. Of course, what is lacking here is the incredibly intensive suspense and electrifying jolts and twists that The Hitcher managed to produce.